Heritage inventories and statutory lists are critical tools for managing cultural heritage in Australia. The inclusion of a cultural site on a statutory heritage list provides legal protection and guidance about permissible or desirable change. It also celebrates, educates, and supports good decision making. Heritage inventories facilitate comparative evaluation, confer status, and inform priorities for resource allocation. In short, heritage inventories make a difference. Many decisions affecting heritage places concern their intended use or proposed physical changes. Where comprehensive inventories exist, these decisions are well informed. Conversely, if the approval system applies provisions to an incomplete or erroneous list, poor decisions and adverse heritage outcomes may result. The conservation policy in the heritage inventory record for this nine-story former warehouse in Sydney states that the roof form and mansard windows should be retained because of their high level of architectural significance, thus limiting opportunities for even a minor addition. Photo: Courtesy of Godden Mackay Logan. Australia uses heritage lists across all three levels of government: national, state, and local. The National Heritage List includes places with outstanding value to the entire nation, whereas state registers cover places of specific state significance. The Sydney Harbor Bridge, for example, is on the National Heritage List, while Sydney's major historic public buildings are on the state's heritage register. Both national and state registers involve rigorous research and assessment processes, including review by experts and formal determination by an elected minister. At the local level, heritage is managed through planning instruments, which have provisions that apply to items on a statutory heritage list or schedule. Schedule is the term used at the local level, while register is the term used for the state statutory list; both provide legal protection. Inventory applies to the non-statutory database that contains all of the information about the place. The inclusion or omission of a particular place on a heritage schedule has significant consequences. This situation has proven particularly problematic when a planning authority allows a property owner to opt out of heritage listing—even when the heritage value of the place has been clearly demonstrated. The three-tiered Australian system can lead to the inclusion of the same place on more than one list (as well as on non-statutory lists, such as those compiled by professional interest groups, like the National Trust of Australia). An important but seldom applied principle for effective resource allocation is that heritage listing and statutory control occur at the appropriate level of government so that duplication and inconsistency are avoided. The fundamental elements of any heritage inventory are accurate identification of the place itself (and its boundaries) and a clear articulation of values. To manage important places, it is first necessary to understand why they are important. If the articulation of values is incomplete or incorrect, problems can arise from a mismatch of expectations among regulators, interest groups, owners, and developers. The level of information provided may be dictated by the budgetary limitations of local authorities. A common issue for ongoing heritage management is the lack of appropriate, well-researched information and thorough justification for heritage listing. The absence of good inventory data can thereby endanger the very heritage that the inventories are established to help manage and conserve. In Australia, heritage values are determined using aesthetic, historic, scientific, and social criteria, as well as other potential factors. These values have been derived from The Australia ICOMOS Charter for the Conservation of Places of Cultural Significance (the Burra Charter). In an adversarial system such as Australia's, where heritage listing or development may be judicially contested, heritage inventories must be robust. Decisions by Australian courts have allowed highly significant heritage places to be inappropriately altered and compromised because the heritage values were not clearly expressed. A particular challenge in compiling heritage inventories is identifying the visual setting of a heritage item in a way that adequately protects it from adjacent development. Experience shows that each word in the inventory listing may be open to dissection by planning lawyers. Nearly every Australian heritage statute is supported by a related heritage inventory. In the state of New South Wales alone, there are more than twenty-seven thousand heritage items listed by local authorities, as well as several hundred conservation areas. Best practice in both heritage and statutory planning demands that every heritage item and conservation area have a separate inventory record. Though this requirement has generally been fulfilled, the data remain inconsistent. Local government inventories vary in their complexity and in the amount of information and detail they provide. For example, the statement of heritage significance for a heritage item, regarded as the critical component of any heritage inventory, may range in length from a simple sentence to a short essay of several paragraphs. Inventories for a heritage conservation area usually identify the heritage significance of the total area but may not necessarily assess the individual properties within it, which may total several hundred. Emerging best practice is that the contributory value of every individual property within a listed area (or a complex site containing multiple heritage items) should be identified, assessed, and mapped. The most useful mapping provides a color-coded grading system identifying the relative significance of each element. In the mid-1990s, the Sydney City Council funded the preparation of detailed inventories for four hundred potential heritage places. The assessment and inventory for each place cost approximately US$1,000. Every record contains detailed information—a historical overview, descriptions of the fabric and alterations, a significance assessment by criteria, a summary statement of heritage value, significance gradings for each element, and a preliminary conservation policy. Each inventory is, in effect, a simplified conservation management plan. From that standpoint alone, the inventories' preparation is extremely cost-effective. 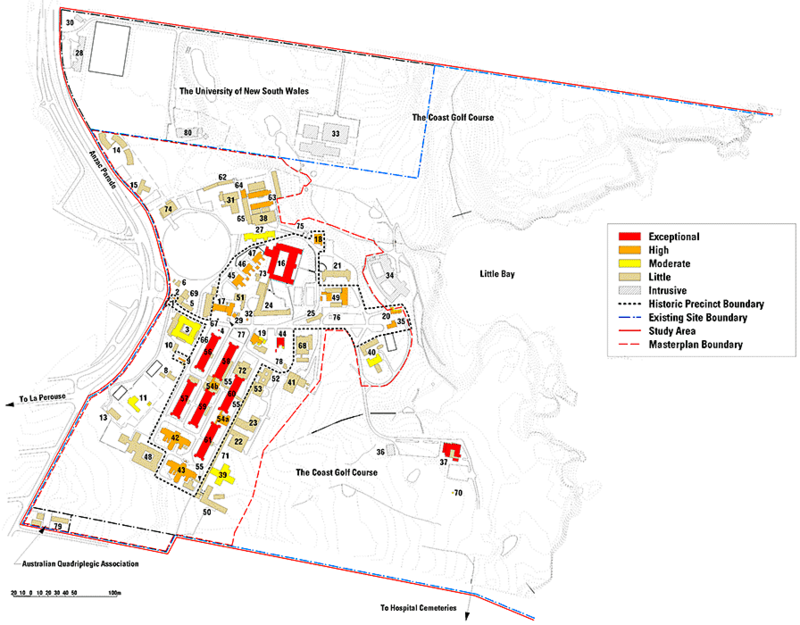 All individual elements at this former hospital site—including buildings, roads, and landscape features—were identified in an inventory and ranked according to their respective levels of heritage significance to facilitate the formulation of policies for their management. Image: Courtesy of Godden Mackay Logan. In dealing with buildings, an important aspect of each inventory record is the significance grading of internal and external elements (structural system, window frames, etc. ), as this information assists council officers in understanding which parts of the building are most significant. An innovative aspect of the Sydney City Council's inventory for each listed property is the inclusion of conservation policies (or management recommendations). These policies provide indications to owners and potential developers about the changes that may or may not be considered for each place. For example, the policy for a particular building may state that a vertical addition would not be appropriate. Thus, a potential purchaser planning to add floors to that building would be forewarned about the risks involved. 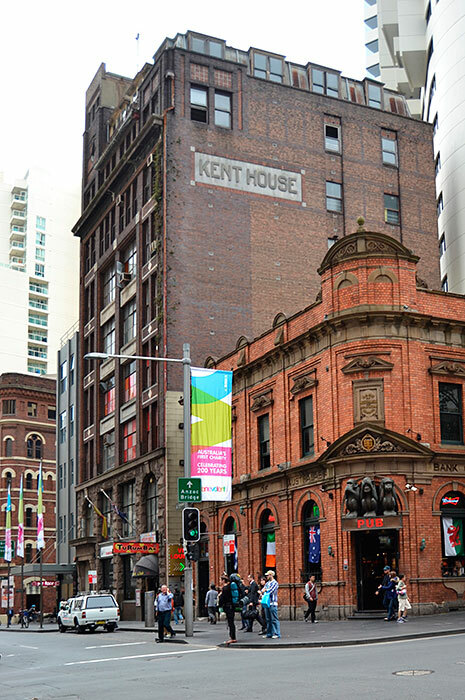 Since preparing the inventories, the Sydney City Council has faced far fewer disputes with owners or potential purchasers of the city's heritage-listed buildings. This political benefit was precisely the objective of the council's lord mayor in funding highly detailed inventories and conservation policies. Fifteen years after their preparation, the city's heritage inventories still represent best-practice Australian heritage management at the local level. To be effective, inventories must be available through online, accessible heritage information systems. In New South Wales, online multivariable searches can identify listed heritage at a local, state, or national level. The State Heritage Inventory database thereby functions as both a useful management tool and a source for comparative assessment. Critical attributes of any successful online heritage database are wide accessibility with a readily available operating platform, intuitive search methods, and easily manageable data downloads. The presence of readily accessible information, however, can also be misleading and even dangerous. In practice, it is rare that inventories are comprehensive. Sometimes the necessary surveys have not been performed. Sometimes local authorities make a political decision not to list a significant place. Sometimes, because of the nature of the heritage—for example, a cultural landscape—that place is not easily included in a simple list. Therefore, best-practice heritage information and management systems should include provisions for protection of the underlying cultural resource, through general regulations and impact assessment. Archaeological resources may be buried, unknown, and revealed only when change or development is proposed. In New South Wales, this issue is addressed through wide-ranging statutory provisions that provide protection to all archaeological features with cultural heritage significance. The onus is placed on development proponents to undertake surveys and assessments, to assess impact, and to propose mechanisms to deal with significant sites encountered during the construction process. There are also examples of proactive archaeological heritage management. Parramatta was Australia's second European settlement and is now a satellite city located in western Sydney. The Parramatta Historical Archaeological Landscape Management Study (PHALMS) uses a geographic information system (GIS) platform and a connected relational database to manage the data for an entire historic city and its subsurface historical archaeological features, which date from the colony's earliest years. PHALMS is founded on comprehensive historical research across the entire city area, combined with ground-truthing and analysis of results from previous archaeological projects. It provides a citywide predictive model indicating locations where archaeological features have been removed and where archaeological sites may yet be discovered. The significance of known or predicted archaeological sites is graded from "exceptional" to "low." An electronic database includes a summary history for every property, together with a succinct values statement, access to historic maps and other resources, and a clear indication of conservation policy and statutory requirements. The PHALMS database is an archaeological inventory that is referenced in planning instruments and used by both local and state authorities as a tool for archaeological heritage management. It assists regulators, owners, and developers in understanding requirements, and it facilitates well-informed decisions. It is a bestpractice model for managing archaeology in an urban context. This multifaceted management system is not ideal, but given the complex and often conflicting views held by Aboriginal and non-Aboriginal people about the value and management of Aboriginal cultural heritage, it is a system that works and that accords Aboriginal people a clear role in managing their heritage. The Australian experience is that even the best heritage inventory may not prevent new development from overwhelming adjacent heritage places or compromising values, such as visual setting, unless statutory controls are aligned with conservation policies and desired heritage outcomes. Where planning objectives and statutory controls (zoning, height limits, etc.) for an area are inconsistent with heritage values, it is unlikely that development opportunities will be forgone in deference to those values. Well-prepared heritage inventories provide clarity regarding heritage values and objectives. They identify places that need to be protected and managed. They inform owners, regulators, and the community. They can help in assessing, managing, and celebrating heritage, and guide in the allocation of scarce conservation resources. In Australia, heritage inventories have grown to be essential in managing the change and development that affect our important heritage places. David Logan and Richard Mackay are partners in the heritage consulting firm of Godden Mackay Logan, which is based in Australia.